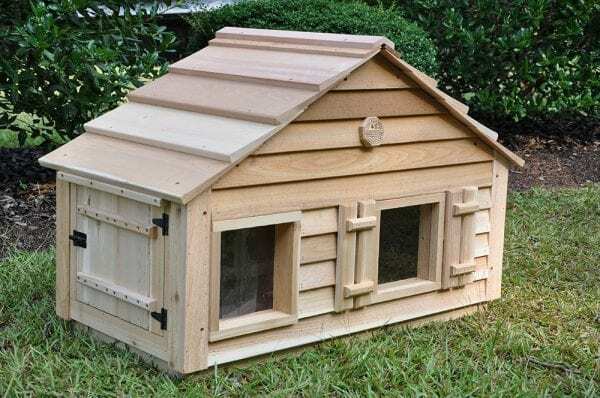 This house has features that cats will simply love: real glass picture window, shutters, and the inside layout is uniquely engineered and designed for one to five cats. The standard lounging ledge is 16 x 20 inches and provides a loft area that can easily accommodate multiple cats. Insulation for this cat house is standard. This house has features that cats will simply love. The Catillac House has a real glass picture window shutters. 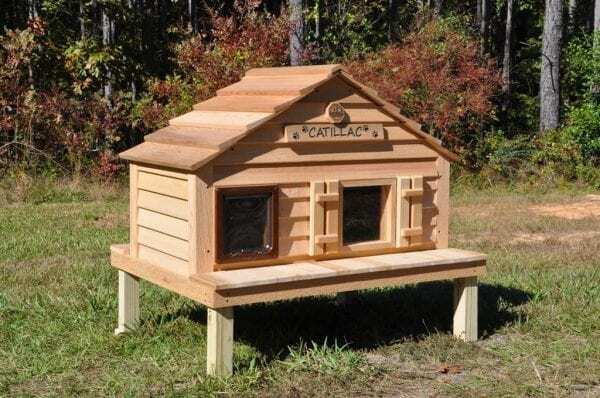 The inside layout is uniquely engineered and designed for one to five cats. The offset door protects the interior from wind and elements. The standard lounging ledge is 16 x 20 inches and provides a loft area that can easily accommodate multiple cats. The Catillac house offers a full line of options that make it possible for you to custom design a cat abode to best suit your cat’s needs and your taste. 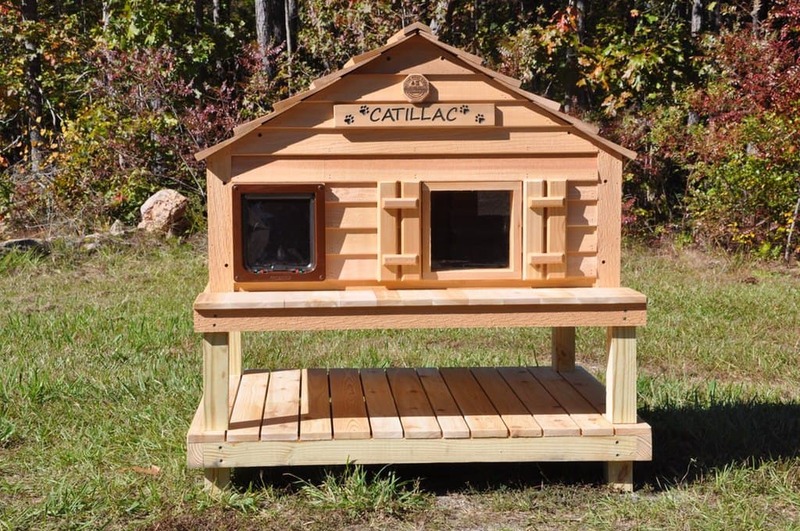 “Peek-a-boo” Clean out door, raised foundations, platforms, porch and deck systems, heat pads, and thermostatically controlled electric heat units are options available for our insulated, western red cedar Catillac cat house. As with all of our houses, it comes with a heavy duty vinyl flap door installed. We also offer an upgrade seal safe magnetic door specifically designed for multiple cats. 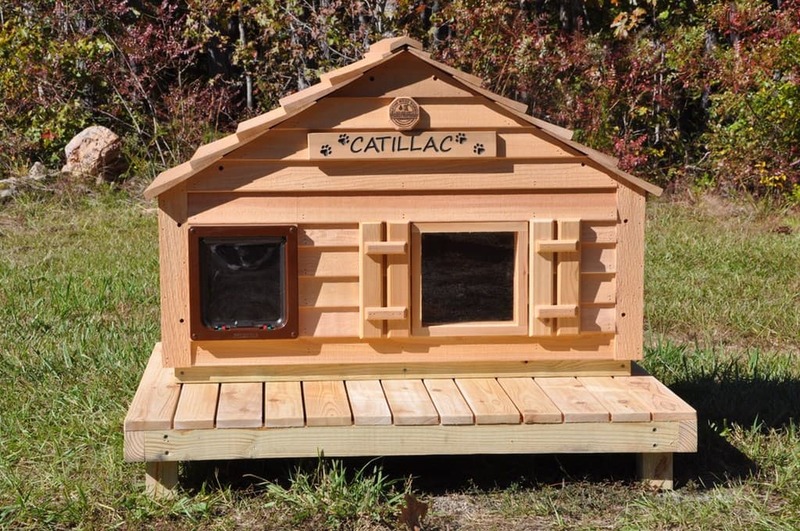 Our cat and dog houses are handmade in America…by Americans, one house at a time. Look and compare our Catillac cat house with anything else out there. We hope to hear from you soon!